We are living at a crucial moment in history – a turning point for the world. We are entering the age of the Fourth Industrial Revolution . Depending on the collective choices we make – as consumers, as communities, as business, government and civil society leaders – these technological breakthroughs could give us the power to move into a world that is even more prosperous, while being more sustainable and more inclusive. Alternatively, we could end up in a world where our economic, political and social systems are more rigid, more unequal and more conflicted. It is imperative to understand and face the choices that we could and should make today, which underpin the Forum's decision to open an office in San Francisco – an international centre that is equidistant from Europe, Asia and South America. More than 70 years ago in this very city, the Charter of the United Nations was signed at the conclusion of the UN Conference on International Organization. In the closing session of the conference, US President Harry Truman said: “The Charter which you have just signed is a solid structure upon which we can build a better world.” Today, we are determined to contribute to a better world by launching an initiative of global relevance. Since that 1945 conference, the world has changed dramatically. It has become more complex, more interconnected, more fast-paced, and certainly more difficult to navigate. What remains unchanged, however, is that in order for us to address the challenges we face, all stakeholders of global society – and I quote again President Truman – “must collaborate to make it work”. What is our departure point? Despite the gloom which prevails in today’s society, by many objective measures this is, on average, the best time in human history to be alive. Between 1990 and 2010, the number of people living below the poverty line globally has been halved. This means that more than 1 billion people are living vastly better lives. Lifespans around the world have increased significantly in the last century. In East Asia, for example, life expectancy at birth in 1950 was 45 years. Today, it is over 74. Both war and violent crime are lower than we have ever known despite tragedies in places like Syria, and despite pockets of violence in other parts of society. In terms of the material conditions and the state of human security, we are, on average, better off than ever before. At the same time, the system we built to deliver this material wealth is failing us in other ways. Many of us are concerned about risks – from climate change to geopolitical instability – which could reverse the gains. You’ll note that I said it is the best time to be alive “on average”. One of the issues we all should be seriously concerned about is the rising level of inequality. In many developed countries, including the US, median incomes have stagnated or fallen, and many people feel that life will be worse in the future than in the past – not only for themselves, but also for their children. Millions of people around the world lack not just economic opportunity but, even more importantly, hope and meaning in their lives. In this sense, we need to take a far-sighted systems approach to avoid the popular backlash that already dominates our political discussions. Technology has played a critical role in shaping both the incredible achievements and the polarizing divisions that exist side by side in our societies and economies today. And now, in the age of the Fourth Industrial Revolution, technology is becoming even more influential in shaping our societies, values and politics. Today, we have a window of opportunity. We live at a time where the norms, values and regulations of technological systems of the Fourth Industrial Revolution are being established. We must not lose the chance to ensure that these systems are thoughtfully aligned with the kind of open, inclusive, prosperous and dynamic world that we want to live in. The World Economic Forum’s motto since its foundation over 45 years ago has always been “entrepreneurship in the global public interest”. We are deeply committed to entrepreneurship as the driver of economic development and social progress. And we have to act fast if we want to avoid the disastrous consequences of the erosion of popular support for our systems of national and international order. Globalization and capitalism are seen as the main reason for people’s anger, but the most profound anxiety comes from disruptive new technologies such as robotization, big data, distributed ledger, artificial intelligence, and many more. We know that these developments hold great promise, but they also raise legitimate questions. The global economy may have entered a “new normal” – as some say – but society is facing a “new unknown”, adding to the general gloom. To reduce the “new unknown”, we need to embed the stakeholder concept into the earliest stages of technological disruption. In this way, we can ensure a holistic perspective is taken and minimize unintended negative consequences. I call this “agile governance” – to ensure that policy-makers and society avoid having to play catch-up later on. This is also in the utmost interest of business. The role of new technologies, and the spread of innovation hubs, is even more important when universal principles and norms support this global deployment. I am a technology fan and by nature an optimist. Thus, when we talk about the Fourth Industrial Revolution, it’s not primarily about the technologies themselves. It is about the creation of new possibilities for humankind and the planet. It is about engaging with technological advances – not as ends in themselves, but as a means to more inclusive economic and social systems. 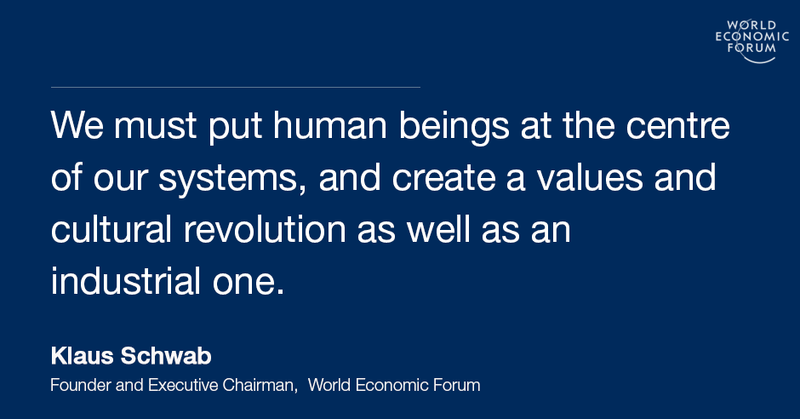 The Fourth Industrial Revolution therefore should help business leaders, governments and civil society find new ways to create value for one another. To help communities grow and become more resilient. To empower, support and meaningfully engage with individuals who otherwise feel excluded from the great advances being made. We must remember that industrial revolutions are not evenly distributed over time and space. There are still many people around the world who have not yet realized the benefits delivered by previous industrial revolutions. Around 1.2 billion people don’t have reliable access to energy. Another 2.3 billion don’t have clean water and sanitation. More than 4 billion don’t have access to the internet. Here, the Fourth Industrial Revolution can serve as a formidable accelerator of social inclusion. The World Economic Forum is presently undertaking many initiatives in this respect, such as the Internet for All initiative , and another on financial inclusion . The Fourth Industrial Revolution should not be confined to wealthy countries or wealthy individuals – it should help us solve the social, economic and environmental challenges we have created in previous industrial revolutions. As I said in my book – which introduced the concept of the Fourth Industrial Revolution and was published in time for Davos in January this year – we must put human beings at the centre of the systems we are disrupting and developing, and create a values and cultural revolution as well as an industrial one. This means that all of us need to think about the consequences, and work now to embed positive values in all of our technological systems. We all have the ability to shape the future of technology. And we all have an enormous responsibility to make sure that technology enables the future we aspire to. The Forum feels that responsibility very acutely, as a platform for people from all countries and sectors, to make positive change. I am extremely proud and excited to officially announce that the Forum is establishing the Center for the Fourth Industrial Revolution in San Francisco. It is intended to be a truly global platform for dialogue, for challenging conversations, for sharing ideas and experience, as well as for joint action on the most important questions of strategy, policy and governance related to the impact of new digital technologies. I invite everyone to engage with the new centre, and play an instrumental role in shaping these conversations. We are keen to understand your perspectives, dreams and concerns about the possibilities of emerging technologies; and keen to bring to the table the other voices, hopes and fears that are not always part of the global technology conversation. This article was based on a speech delivered at the opening of the World Economic Forum Center for the Fourth Industrial Revolution.